Completely shopped 100%, looks great and plays fantastic. Perfect back glass. All rubbers replaced with new, all contacts adjusted, all bolts and screws checked and tightened. All electronics are original, serviced, and in perfect working order. 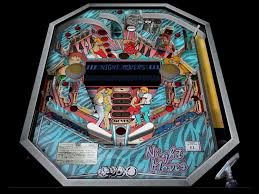 This machine has one of the most famous back glass art work ever produced in pinball history. Add this one to your collection or start a new one with this highly collectible machine ready for a new home. Enjoy a piece of pinball history and turn on this machine and listen to the start up tune known in professional horseracing as “The Call to the Post”. Asking 1650 or best offer.